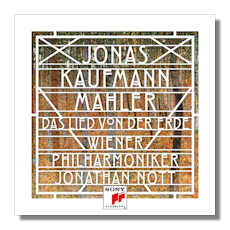 This recording has generated a good measure of controversy owing to the decision to have superstar tenor Jonas Kaufmann sing both soloist roles in this great Mahler work, the first time this has ever been done. Mahler wrote Das Lied von der Erde for tenor and alto (or baritone) soloists and orchestra, and of course Kaufmann sings the tenor and baritone parts in the six songs that comprise the piece. The male-female combination has most often been used in concert and on recordings, but some of the most effective performances have involved a baritone. (More about this later.) It's not surprising that a fair number of critics have found significant shortcomings in Kaufmann's baritone singing, several calling this precedent a "stunt". Conversely, a good many reviewers have praised both Kaufmann's tenor and baritone work here, finding it quite impressive and rejecting any idea of a stunt. I regard this Das Lied in mostly positive ways, viewing Kaufmann's vocal effort perhaps as a stunt of sorts, but as a very successful one. Yet stunt or no, I think we're all missing one of the most important points here, because there appears to be a very large pink elephant in the room that so far no reviewer that I am aware of has commented on. In such a work as this – really a symphony with two vocal soloists – it is the conductor who decides on interpretive matters, not the singers. Right? But when you have one soloist in a composition – as in a concerto for piano and orchestra – it is usually the soloist who mostly makes interpretive decisions. That would also hold true in a work for solo singer and orchestra, which is essentially what we have with this new Kaufmann rendition of Das Lied. So, is Jonas Kaufmann not only taking on the demanding role of singing both parts but also of shaping the score, determining tempos, etc.? I think that is perhaps the case, or that he has at least a very large role in forging the interpretation. Consider these further circumstances: conductor Jonathan Nott has recorded an acclaimed set of Mahler's nine symphonies with the Bamberg Symphony Orchestra on the Tudor label. If he were going to complete "his" Mahler cycle with this work, why would he not do so on the Tudor label with the Bamberg ensemble and two soloists of his choosing? Thus, I'll surmise that this is more Kaufmann's show than Nott's. That said, I'm sure Nott still had a good deal of input into how the Vienna Philharmonic Orchestra played and in the overall interpretation itself. There are, after all, long sections of pure orchestral music in this work, particularly in Der Abschied, where he would likely be making the interpretive decisions. Whatever the case, this is a fine, though perhaps not outstanding Das Lied. Make no mistake though, fans of Kaufmann will certainly want this recording, as will admirers of this great Mahler work. It's true that Dietrich Fischer-Dieskau, Thomas Hampson and others have set the bar high in their accounts of the baritone songs, but Kaufmann's effort is impressive still. Firstly, in the tenor songs Kaufmann is excellent: try the opening number Das Trinklied vom Jammer der Erde, where his rich heldentenor voice resounds both energy and sorrow in gorgeous tones, effectively conveying the conflicted and dark character of this song. In the much shorter Von der Jugend and Der Trunkene im Früling he is just as convincing. Arguably, the most substantive (and difficult) songs here are those for baritone, the first two of which – Der Einsame im Herbst and Von der Schönheit – Kaufmann sings quite well. But it is the last of the six songs, the aforementioned Der Abschied, comprising nearly half the length of this hour-plus long work, that is the most challenging. Here Kaufmann is gripping, effectively conveying the feelings of loss and sadness. True, his voice may lack the weight and depth of Fischer-Dieskau's and Thomas Hampson's, but he is effective still. Moreover, Kaufmann's voice is captured in very detailed sound by Sony, as is the orchestra. Speaking of the orchestra, Nott draws fine playing from this excellent Vienna ensemble and whether it is he or Kaufmann who is mainly responsible for the interpretation, Mahler's music is generally well imagined here, the phrasing sensitive, and the tempos judicious, if ever so slightly on the brisk side. In the end, the orchestral contribution is solid if a bit refined. Sony Classical provides full texts in German, English and French. There is also an interesting interview with Kaufmann included in the album booklet mostly about his thoughts on Das Lied. Highly recommended, especially to fans of the singer.